Could Renting Snowmobiles be The Future? Growing up in Parry Sound in the 80’s & 90’s we experienced a hay day of snowmobiling. Most families had a fleet of snowmobiles and we were always guaranteed an abundance of snow and ice. Boy, times have changed, and now I’m wondering if renting snowmobiles could be the future of snowmobiling for many. Fast forward and now it seems like snowmobiles are a luxury and even our early January weather isn’t cooperating to get trails open and cross the ice safely. Conversations about the future of our favourite sport are abundant. What does the future hold? Will manufacturers continue to produce new snowmobiles? Will the weather patterns change and bring back consistent winters? Will families continue to snowmobile? Snowmobiling is my favourite past time and I’ve spent time promoting, testing, and investing in our sport’s future, and I’ve squeezed every drop of copper from a penny to ride longer on a Sunday night. Over the years I’ve met many people who were snowmobilers that have moved onto other sports because of the high cost, time commitment, and family/work commitments. It has always been heartwarming to see them return when their life allows them because like me, they love the freedom of being out. There are also many people who would love to try snowmobiling for the first time. Some of them feel nervous. Some of them find trail riding daunting or feel it’s unsafe to get started. Well many of the conversations I have involve the discussion of areas/resorts that still receive annual snowfalls having a rental fleet of snowmobiles available. This would allow people to avoid the annual/reoccuring ($1500-$5000/year) ownership cost and still get out and enjoy our beautiful winters. The cost of ownership for me has always been at least $3500/year, but usually more. Insurance and trail permit cost around $500-$700 depending on year, make, and model of my snowmobile. Depending on the year, carbides and studs, a new track could cost $500-$1000. And let’s not forget upgrades like shocks, skiis, and other accessories. And we haven’t even gone for a ride yet. Many years we’ve logged 1000’s of kilometers leaving right from our doors and fuel and oil is our only expense. We’ve also enjoyed trips north meaning we’ve added the cost of owning a truck/trailer to do so. Yes, we’re diehard sledders. Now that I’m working internationally I have sold my snowmobile and it will take some time before I consider ownership again. What will I do in the meantime…..I will RENT!!! And I’ll be renting where the snow is. My friends at Horwood Lake Lodge have taken a leap of faith that I feel many others will need to in the future. They have a rental fleet of snowmobiles and snowbikes provided by l1feoutdoorsatv.com. They are brand new 2019 Ski-Doo Summit Sport machines. 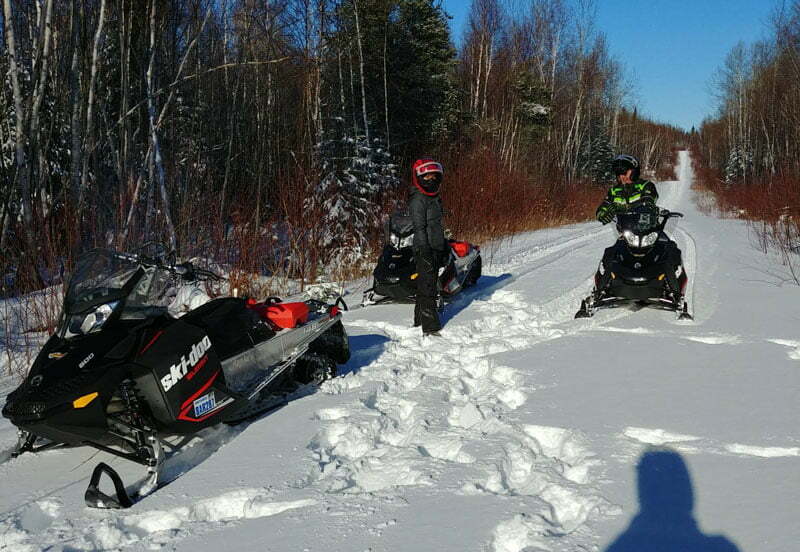 In this setting the area boasts off-trail “boondocking”, ice fishing, and lake riding where trail permits aren’t required, and space is infinite, allowing you to learn and the freedom to play and enjoy yourself. We need our sport to survive. We need to keep current sledders out riding. We need past riders to return to their roots and the exhilaration. And most importantly we need new riders to have the opportunity to fall in love with our sport! Why wouldn’t you go rent a snowmobile? This entry was posted in Snowmobiling. This webpage was developed with assistance by NEOnet Inc.